One of the greatest multiplayer arcade games of all time could be returning soon to Nintendo's arm flailing machine. Sports games are a big deal, mostly if you like sports, and at one time none was bigger than NBA Jam. Mind you, this was when the mythical arcade existed, and actually was still profitable. 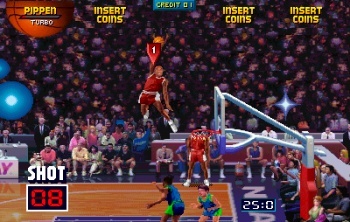 Sources have told ESPN that EA is bringing NBA Jam back exclusively to the Wii. Original designer Mark Turmell is even working on it, giving the project some hope. NBA Jam was an arcade dunk-fest for up to four players that guest starred many secret characters (including Bill and George Clinton), with an announcer that popularized the phrase "He's on fire." In NBA Jam, this meant that you made smoke come out of the basketball and could hit 3-pointers endlessly unless your opponent found a way to stop you. Dunks often saw players fly through the air, flipping and twisting in outlandish fashion. Cheat codes had to be hastily entered before the game started that would unlock big-head or turbo modes, amongst others. In other words, it was a great arcade game. As much as I do enjoy the Wii, I don't know why anyone would think making NBA Jam exclusive to it is a good idea. You can play Wii games online, but the system is basically not meant for it, and NBA Jam is a franchise that you need to play with other people. Party game, shmarty game, online play is where it's at with a NBA Jam remake, at least if its done right. In addition, most sports gamers would own a 360 or a PS3, not a Wii. I'm hoping that ESPN's sources were just slightly off, and this NBA Jam remake (if real) will also come to other systems. An official announcement should be made later this month.